Today was another tempo run. 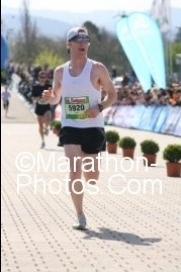 I ended up around marathon pace (6:28 miles). Much slower than i had hoped for, i was hoping to end up around 18:45, ended up around 19:25. Its okay though looking at the circumstances. It was morning speedwork, which i find is always slower for me. Plus i had a short turnaround on mileage yesterday which was in the afternoon, so i only had about 16 hours between workouts. With that in mind, today was not a bad workout at all, and it did actually feel pretty comfortable. Just got to get my breathing together in this cold air which is always a challenge. Really slow mileage tomorrow!